Designed to work in all 350 million square kilometres of the oceans on Earth, whether you’re surfing, kitesurfing, paddleboarding, sailing or wakeboarding, these are the most advanced shorts anywhere on the planet. With every detail cut by lasers, bartacks welded on for strength, and all seams and stitching replaced with bonding so nothing can chafe, they’re a stripped-down feat of engineering. Highly abrasion resistant against reefs and rocks and with soft Italian mesh protecting your balls, they stretch like an elastic band, block UV and repel water with plant-based technology. And by building the world’s best board shorts, we’ve created the most versatile shorts ever made – as high-performance on a mountain as they are in the mid-Atlantic. We shot the Ocean Shorts: Granite edition on kitesurfer, surfer, wakeboarder and climber Murray Smith, who is 5ft 9 / 175cm and wearing size medium. 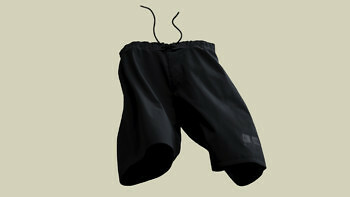 The shorts are built with a highly elastic waistband and rope tie fastening. If your waist measurement puts you on the borderline between two sizes we recommend choosing the smaller size. The reason shorts don’t normally look as good as supercars is because no-one has ever spent hundreds of hours trying to make them look as good. So we did. Every design decision was made to enhance their performance, with the aesthetics and form falling out of that. With every detail cut by laser, bartacks welded on for strength, and the seams bonded for simplicity, the reason they look like a stripped-out feat of engineering is because they are. Whether you’re a kitesurfer or a yogi, there’s literally no move you can pull where these shorts will restrict you. If you were holding a metre of this fabric, you’d be able to stretch it to 1.5 metres in any direction, and as soon as you let go it would instantly return to its normal shape thanks to the huge amount of elastane we’ve used. Stronger and more durable than rubber, the more elastane you blend with another material the stretchier it becomes. These shorts are 34% elastane making them unbelievably stretchy. 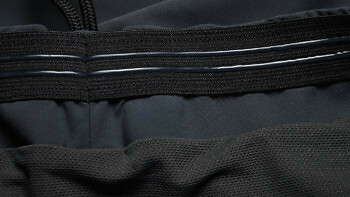 The material we’ve used was originally designed for compression gear so it’s incredibly strong. We’ve simply laser-cut it into the shape of non-compression gear. The strength of the material remains identical but you have none of the pressure on your muscles. Every inch of fabric has been knitted by 40 needles, so unlike normal knitted fabrics it’s incredibly dense. This means that on abrasion tests, which show you how fast you could destroy something on coral reefs or a dirt track, it scores 5 out of 5 for toughness. Amphibious shorts that are just as amazing on land as they are on water. While we set out to build the best shorts on earth for the water, everything that makes them amazing for the oceans makes them phenomenal back on land too. They’re so light, stretchy and seamless you can run an ultra-marathon in them. They’re strong and resilient enough to cope with any mountain biking, climbing or hiking trip. They’re as soft and comfortable as a pair of sweat pants if you just want to kick back. While the cut and simplicity means you can wear them to the office. You probably won’t have ever worn a pair of knitted board shorts before, but they represent the holy grail of sports gear – incredibly strong, stretchy, soft and lightweight all at the same time. By blending elastane with a super tough nylon yarn, we’ve created a unique knitted fabric. With millions of microscopic knitted loops, it manages to feel as soft and stretchy as your knitted socks and sweaters, while being as hardwearing and smooth to the touch as a mountain jacket. 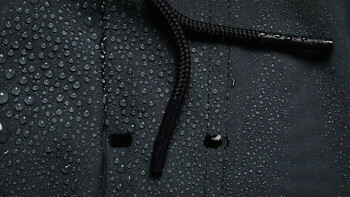 For decades, brands have been using toxic fluorocarbons to make their clothing water repellent. But ocean spray simply rolls straight off these shorts without a chemical in sight. We’ve gone back to the Stone Age and used a plant-based technology that penetrates deep into the fibres and makes water simply slip off the surface. The same tech makes them fast-drying out of the water, and when you want to hang them up to dry you’ll find a reinforced drying loop just above the waistband. Built with just one bonded seam our Ocean Shorts represent a radical leap forward in engineering. Normal brands use lots of stitched seams even though they chafe your legs as it’s the cheapest option. These shorts have only one seam, and it’s bonded – which means it’s glued with an incredibly high heat. It’s the most expensive construction method there is, but the result is there are simply no stitches to rub you or to stop the shorts stretching. A lot of shorts simply look bad when they’re wet, even though they’re designed for water – they either cling to you or billow out like a jellyfish wrapped round your legs. 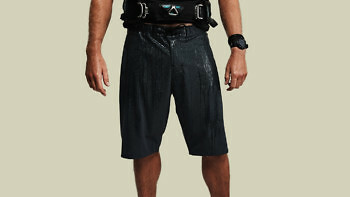 So we’ve engineered these shorts to look as good on you when they’re wet as they do when they’re dry. The bottom hem of each leg is laser cut then reinforced with bonded tape to give it enough weight to hold its shape however soaked you are and stop the shorts clinging to you. 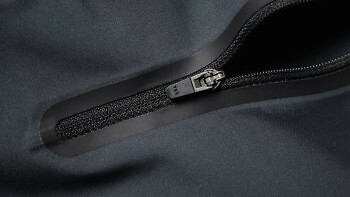 Even the rear pocket is designed to operate in the simplest way possible. Big enough to hold your phone, card and keys on land, or a GPS in the water, there are two laser cut holes in the pocket with welded edges that allow water to drain at high speed rather than billowing up with air. The pocket is fastened with a rubberised zip that’s lockable and housed in its own zip garage, so once it’s done up it won’t come undone. 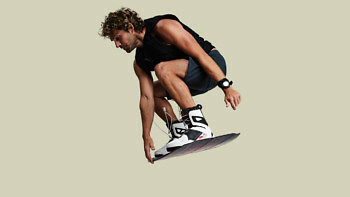 The shorts are rope tied and have a Velcro fly, so there’s nothing that can cut into you or your board. 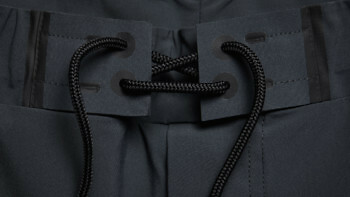 The rope has rubberised ends and is woven through laser cut holes which have been welded for extra strength. On the inside of the waistband you’ll find two silicon strips that run the entire circumference of the shorts in two channels built into an elastic tape. They grip your skin and keep your shorts secure. And the more you sweat the more they grip. Good design matters, even when you can’t see it. And it matters even more when it’s next to your balls. The shorts’ inner lining is made with one of the highest grade and lightest materials on earth – an Italian mesh fabric that’s so soft and comfortable we’ve already made entire t shirts and baselayers out of it for our Black Light range. It’s fast-drying, made with 25% elastane, and has seams that are bonded flat so it won’t ever trap, catch or grate you. Just like sunblock, fabric can be rated for its ability to reduce your exposure to the sun’s ultraviolet light. The Ultraviolet Protection Factor, or UPF, determines how much more protection your skin would have while wearing that piece of clothing. A UPF rating of 15 for example would give your skin 15x more protection than it would have if it was unprotected. These shorts are so densely knitted that the fabric scores a UPF of 50+ which is the highest possible rating, giving you the highest possible protection.